Image caption Demos said charity shops can help "spur local regeneration"
Charity shops boost local business, combat unemployment and even help tackle social isolation, according to a report by the think tank Demos. The report says despite negative perceptions there is "no evidence" the shops cause "High Street decline". 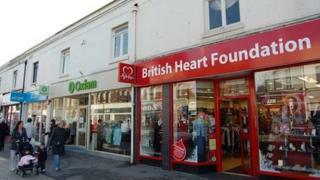 Councils should "do more to support charity shops", the report adds. The rising number of charity shops has led to calls to limit their numbers, but the report says the benefits they bring are "often unrecognised". In August, the Mail on Sunday said research showed there had been a 30% increase in the number of charity shops in Britain since 2008 - taking the total to more than 10,000. There have been calls for a cap on charity shop numbers, and the removal of tax concessions and business rate relief they currently benefit from. Ally Paget, a researcher at Demos and the author of the report, said charity shops themselves must do more to tackle "negative public perceptions" and highlight the "huge contributions they make to communities". "It is a real shame that the multitude of benefits offered by charity shops is so often unrecognised and under used, especially in this time of austerity," she said. "Local authorities can and should do more to support charity shops at a business level, and to draw on the capacity of charity shops to spur local regeneration." The report says charity shops make a "colossal" environmental contribution by reusing items, reducing the UK's CO2 emissions by an estimated 3.7 million tonnes per year - "roughly equivalent to the entire carbon footprint of Iceland". Demos said its research showed charity shops keep shoppers on high streets. "Our analysis and our public survey results suggest that the growth of charity shops on the High Street is a symptom, rather than a cause, of High Street decline," the report adds. It says data showed charity shops "do not increase rents for other shops" and "do not prevent small and medium-sized businesses from opening" on high streets. The research also found charity shops help combat unemployment, with more than 80% of volunteers saying they were using their shifts to gain retail experience as a path to paid employment. The report recommends that job centres should promote volunteering in charity shops to more jobseekers. Charity Retail Association figures show the shops employ 17,300 paid staff and have 210,000 volunteers in total. The report says charity shops help tackle health and social problems, particularly social isolation. Many staff surveyed by Demos said their shops often acted as a form of community centre for older and vulnerable people to simply "drop in" for a chat. Demos conducted a poll of 2,200 members of the public, as well as around 150 charity shop managers and 150 volunteers. Some 91% of volunteers cited socialising and meeting new people as a benefit of volunteering, and 61% felt their volunteering led to improved physical and mental health. Warren Alexander, of the Charity Retail Association, said charity shops not only raise "vital money" for good causes but also "bring huge value to their local communities". Can spending £5 a week save your local high street? Viewpoints: What should be done about Britain's empty shops?